PetAlive Sinu-Rite - New Look! Sinu-Riite helps to relieve the symptoms of sinusitis in dogs and cats: sneezing, discharge from the eyes and nose, coughing or gagging and a runny nose. 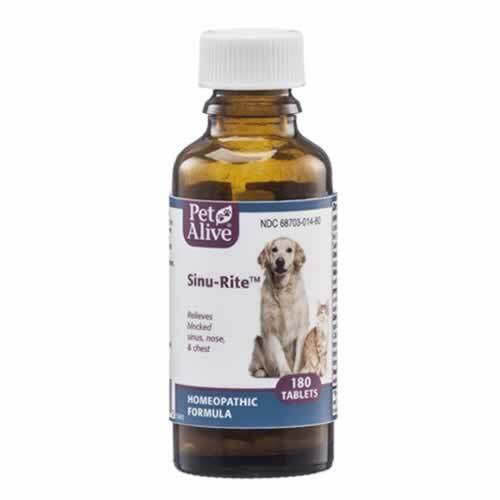 Sinu-Rite is a natural homeopathic remedy formulated to relieve the symptoms of sinusitis in pets. In addition to addressing those symptoms related to sinus infections, Sinu-Rite also reduces recovery time and strengthens your pet's immune system to prevent recurring infections. Each bottle contains 180 tablets. These really work! My rescue cat who has medical issues from his years of hard living and starvation has had a nasal drip that wasn't responding to antibiotics, but these pills really help. Nat mur (6X) is a biochemic tissue salt that helps to maintain the body's fluid balance and is an essential component of all living cells. This tissue salt has excellent effects in supporting respiratory health and keeping sinuses, noses, and chests clear and healthy, thus supporting the health and integrity of all the mucus membranes of the respiratory tract. Pulsatilla (30C) is a natural remedy useful for keeping sinuses clear and healthy. Kali bic (30C) is a natural remedy that is recommended to soothe the throat and respiratory tract and support sinus health. Glycyrrhiza (3X) is a widely used homeopathic remedy that helps to open up the respiratory system, including the nasal passages. Sambucus nig (3X) is a homeopathic remedy known to help facilitate the loosening of nasal matter, thereby helping to open the nasal passages and have a positive effect on the sinuses and the respiratory system. Sinu-Rite tablets may be given whole or crushed and mixed with food or a treat, depending on your pet's size and preferences. 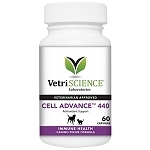 VetriScience Cell Advance 440 - Antioxidants for Cats & Small Dogs - 60 ct.